Battle backgrounds can be used to provide some sense of atmosphere. For example, if you’re walking through a forest and you encounter an enemy, seeing some cute bunnies and trees in the background makes it feel like a forest. However, if you see dead bunnies and dying trees in the background, it feels much different. What happens if an enemy can cast a spell that will cause all of those bunnies and trees to die during battle? 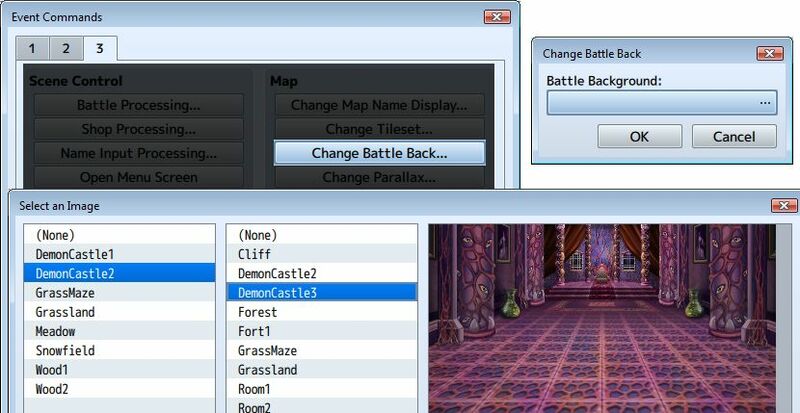 RPG Maker MV comes with an event command that allows you to change battlebacks. However, if you try to change battlebacks during battle, you’ll notice that nothing happens. Instead, the change will only appear in the next battle. This plugin allows you to change battle backgrounds during battle. Download ths plugin and place it in the “plugins” folder in your project’s “js” folder. Then open your Plugin Manager (F10), double-click an empty row, and select the HIME_ChangeBattleback plugin. During battle, use the “Change Battleback” event command located on the third page of the event commands. This will change the battleback immediately. The changes will only last for the current battle, and will revert after the battle finishes. You can choose to include other animation effects such as screen tinting, screen shaking, and so on to make the transition more interesting. There may be situations where you want to change the battleback, and you want to restore it to what it was before you changed it, but you didn’t know what the battlebacks were because they could have been anything at that point. This plugin provides functionality for saving the current battlebacks and then restoring them. I have a problem like mrcopra. Here is my picture 「https://imgur.com/a/yTBvyYA」. It looks like picture is be cut-in-half. How to solve it? I might have the same issue that mrcopra had. Both my bottom and top backs are cut-in-half and juxtaposed. I think I can manually fix this by editing all of my BGs. Not sure if its an issue on my end or the plugin. What is the width and height of the image? Does this occur when this plugin is disabled? It’s working now, I don,t know what cause the problem. Sorry for the delay but i thought you ignored my question because i was waiting for email notification. Will need to check my settings for email notification. Not sure if it’s set up properly. This doesn’t seem to work if I call the common event with Yanfly Action Sequence. What is the proper procedure to change the battleback immediately after defeating the last/only troop member? It’s about the same as any other event that should run when all enemies have been defeated. You might choose to have an event run after the last enemy is dead. How you might go about checking for that would be up to you. You might use something like custom page conditions to directly set that as the condition for the page. Hi. I am wondering you do I go about and set this up? I want to change the battle background during a skill usage and revert it back to normal after. Is this possible? if so, how to set that up? thanks! Is there a way to make the background scroll or is that another plugin? It will be a separate plugin.